Mawlana said that his Holy Guide and Master has been chosen and granted the task of advising the masses, to help Man correct himself, and to show him how to put his feet on the path of holy ones and to unveil to him about his real self – every one of us is in need of the guiding light of the ṣādiqīn, whom within them are shining lights. 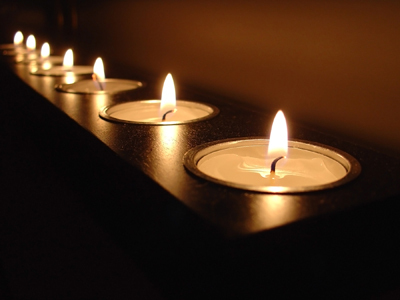 Mawlana said that every human being is carrying a candle – most of us have unlit or sleeping candles that are unable to show us the way in the dark. How are our candles to be lit and awakened? We need someone to light our candles! Mawlana recounted his childhood, when he stayed in the neighborhood of the Albanian people of Nicosia. The locals were diligent craftsmen; they were an upright and hardworking people who preferred working the fields to working in the town. They were a close-knit society, honest, non-fanatic, pious and united. Mawlana recounted that during weddings at the local Church, the residents would gather, and everyone would arrive with an unlit candle. At the entrance of the Church, one man would use his lighted candle, to light the extinguished candles of each of the thousands of worshippers entering the Church. From that single lit candle, thousands of people acquired lit candles, and the flame of the first candle that was used to light all the other candles, did not diminish. Its flame did not become smaller or weaker at all even after sharing that light with so many others. Similarly, those who seek spiritual guidance – heavenly lights – will be brought by Allah to meet one such person who holds a Divine ‘lighted’ candle and to take from that light. Only those who seek such Divine lights will be brought to such a person. We must seek out a person with a lighted candle, if we wish to light our unlit candles. Many people seek to light their candles, by seeking out those who do not possess a lighted candle. You may approach a person who may be a well-known cult figure, or he may be an academic holding a string of paper qualifications that pronounces him to be a learned one (i.e. PhD, Doctorate of Sharī’ah etc), or he may look very holy and important (i.e. wearing a jubbah etc) – but he may not be one who has a lighted candle. Instead, Allah may bestow upon a old, simple, unassuming, weak and low-profiled person, the lighted candle that you are seeking – that old man may be able to awaken ‘extinguished’ hearts, with the light from his heart. It is the norm that many people disregard these Divinely-sent carriers of lighted candles, as they often hold no important worldly positions and may be people of low-worldly status. Prophets were also spurned because they were simple people, like shepherds. So many Nations denied and defied their Prophets, as they were judged by their physical dressings, as being unimportant people! It is a terrible mistake to turn our backs on such enlightened people – we are in dire need of their lighted candles! Why do we turn them away? There are diseases of the body and there are also diseases of the soul. Physical diseases can be treated medically, but spiritual diseases need spiritually connected doctors, and such lighted ones are the spiritual healers that we desperately need. The diseases of our egos are very serious ones, many of us go through our entire lives blind to this, and hence walk the Earth with arrogance and pride. It is not easy to treat these diseases. Only spiritual guides can diagnose and prescribe the cure for such malignant cancers, but such guides are often disregarded, and very few people give them their due respect and reverence. Allah gives elevated spiritual levels and specialties to whomever He pleases. Often, recipients of such honor and duties, are people who are very simple outwardly. They do not try to show piety or status in their dressings. Man is honored because of his spirituality (real being), not because of his physical body – we must learn to look beyond the external, and not be duped by it. Allah, in His Infinite Wisdom, hides treasures in the remotest and most desolate places, within ruins and shipwrecks. Such places look so ordinary, but they contain so much untold treasures. Hence, Prophets never displayed any magnificent physical prowess to their Nations, instead they brought spiritual enlightenment for those humble enough to accept it. So many religious leaders dress so ceremoniously and grandly, they dress in expensive outfits as if they have descended from the heavens above! They are so conscious of their public appearance – Mawlana asked, has this sort of behavior ever been taught in our Holy Books? It is a 21st century phenomenon, that almost all people are showing respect for the physical dressing, rather than the spiritual clothing! People, even religious ones, feel ashamed to wear simple and common dressing, as beautiful dressings appears to draw more respect from foolish ones. The person himself (like Khwaja above) is not respected, instead, the clothing he is dressed in, is what is being honored! Men of these times are busy beautifying their external beings, while completely ignoring their inner and spiritual states. Man no longer understands the need to clean his heart. Mawlana advised us not to seek respect from humans, it is meaningless; instead, seek honor in the Divine presence, be one who approaches Him with a pure heart, as a sincere servant of His. In summary, this suhbah teaches us to seek out those with lighted candles amongst us, and to look beyond the external as a measure of someone’s piety. Instead of seeking praise by putting on magnificent clothing for our exteriors, we are to strive for spiritual honor by cleansing and beautifying our hearts, so as to acquire Heavenly Dressings of light – perhaps we may become a candle that may also enlighten others. At the end of the suhbah, Mawlana invited world leaders of all religions to visit him to celebrate his 88th birthday, and that he would extend his respect and honor to all those who came, regardless of their religion, as the Prophet (saw) had said, “Honor those who are honored by their own people.” Just as Jesus (as) treated his Companions to a heavenly spread, Mawlana would also treat his guests to such a feast.